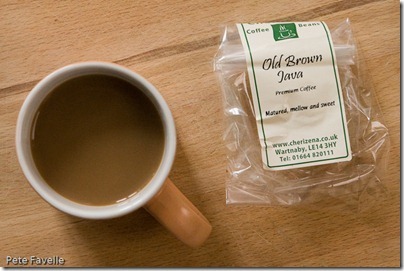 This week sees the return of Cherizena, the coffee suppliers I encountered last year at the Abergavenny Food Festival. 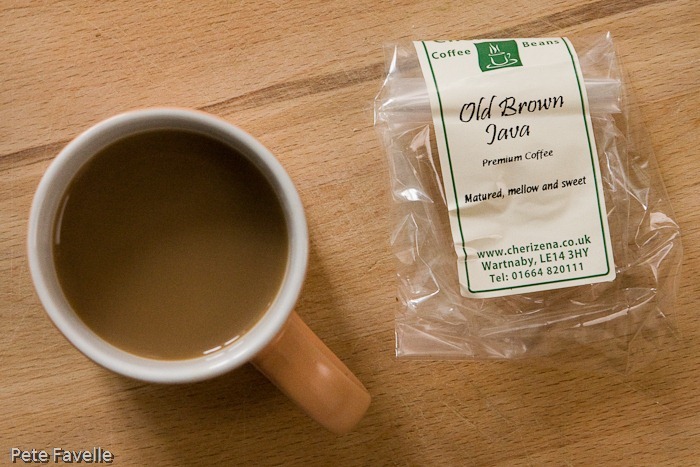 This is their Old Brown Java, which has been aged for two years before roasting. I’d never really thought about the ageing side of coffee production, and if nothing else this coffee has inspired me to do some more digging on that side of things! The grounds have a gently sweet, slightly woody aroma with a suggestion of black cherries dipped in bitter dark chocolate. Brewed, the fruit aromas are lost and the bitterness is more pronounced. It also gains an undercurrent of slightly burnt sugar. In the mouth, it’s a pretty decent coffee. It has a distinct bitter edge, slightly stronger than the medium body would suggest but not overwhelming. Beneath that is a subtle, slightly sweet fruitiness. Not stunning but flavoursome and easy drinking, this earns 2.5 stars.